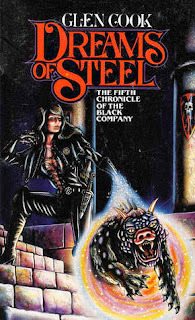 The book follows the story line of both Lady and Croaker, who have been separated from the Black Company after the company's defeat at the end of Shadows Game. Lady was separated as she was overwhelmed by dying soldiers and her story begins with her digging herself out of the pile. She quickly hooks up with two strange men, Narayan Singh and his partner Ram. Lady, with those two, begins to re-assemble the army of Taglios. Lady is much different from Croaker's style of managing the people of Taglios, eliminating those that try to stand against her. Narayan Singh is a leader in a shadow religious group who are known as The Deceivers, and worship the goddess of Kina. Kina is a Goddess of Death, and the Deceivers are trying to bring her back to this world. Lady believes that she is using the Deceivers to further her agenda, while avoiding the seduction that Kina appears to be trying against her. While Lady builds up the Taglios army, Croaker is in the company of Soulcatcher - Lady's sister. Soulcatcher wants Croaker for two reasons. To heal her of the wounds that she received in the Books of the North, as well as to take revenge out on her sister. Soulcatcher agenda is to spread chaos. She dresses as Lady and attacks the Shadowmaster's army to sow confusion of where anyone is. Her plan backfires as Longshadow, along with his new ally Howler, kidnap her instead of Lady. Longshadow wishes to use the knowledge that Lady has to further his own agenda. With Soulcatcher taken away, Croaker uses that freedom to escape and rejoin the army of Taglios. Lady and Croaker miss each other and end up on opposite sides of the river, when river rises and makes fording impossible. Lady discovers that she is pregnant with Croakers child. At the end of the book, it is revealed that the Deceivers came for her baby and escaped. Kina was not after Lady, but Lady's child. Want to have an Internet Cafe business?